A dark, starry sky slowly lowers onto the desolate and dusty crimson sphere. 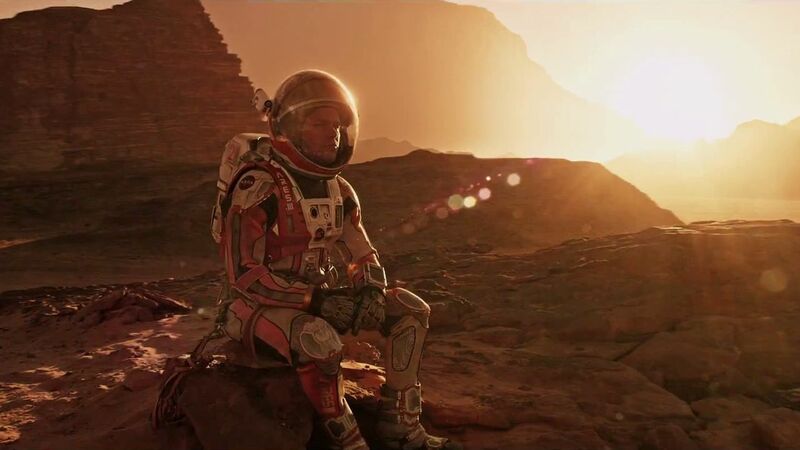 Mars, a planet usually associated with barren landscapes, is given new life with this adaptation of Andy Weir’s novel The Martian, directed by Ridley Scott and starring Matt Damon. The film follows astronaut-botanist Mark Whatney (Damon) as he is stranded on the red planet following a violent storm that forces the rest of his crew to abandon him. The power of reasonable deduction and good humour act as Whatney’s greatest strengths in his attempt to survive the hostile environment and wait for his colleagues back on Earth to formulate a feasible, and financially-capable, rescue. The illustrious cast provides a vast canvas for Scott to bounce between comedy and drama as each scene transitions from Mars to Earth, and in between. Kate Mara, Jeff Daniels, Jessica Chastain, Michael Peña and several others all provide excellent performances and grip into the dense text adapted by Daredevil showrunner Drew Godard. Two performances that stand out of this glowing cast come from Chiwetel Ejiofor and Community alumnus Donald Glover as scientists tasked with bringing Whatney home. They bring a diversity to the scientific community by showing strong-willed men who do not back down in the face of a challenge. Rounding out the film is a stellar performance from an always-on-form Damon. His work to bring humanity to his character distances himself from the pantheon of “lone survivor” types in films with his wit and positive outlook on the situation, be it from tending to a necessary crop of potatoes to flipping off the commissioner of NASA. While it would have been nice to peek into the darker side of total seclusion, the performance is on point and one of the front runners for this year’s soar season. Treading on possible relations to last year’s Interstellar, Scott takes the great unknown and brings it beautifully to life in the best film of his recent catalogue while distinctly varying the well-known look to mine something new and interesting. This is indeed thanks to recent collaborator Dariusz Wolski who brings the vast, open expanses to the screen in stunning oranges and popping (in this case due to the well used 3D) visuals. Tying together in a well-rounded and entertaining final act, the film almost runs too long at 141 minutes but keeps interest all the way through until the last frame. The stellar cast and smart direction take the material to an altogether different level: one that not only makes The Martian a smart and funny movie, but also as one of the year’s best. So dust off your 3D glasses and strap in for lift off. 4.7/5 Loops.